The Fantasy Big Band is an ensemble of 18 talented New England musicians specializing in the great music of the Big Band Swing Era. With complete big band instrumentation and sensational vocalists, we present the most popular hits of the 30’s and 40’s, along with contemporary dance tunes. 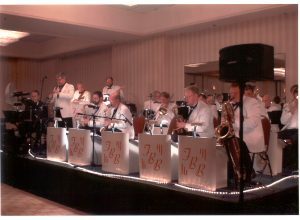 The Fantasy Big Band on Stage for a Black Tie Gala. From Glenn Miller and Benny Goodman to Frank Sinatra and Brian Setzer, we play the songs that need no introductions. Most selections are played from the original arrangements or very accurate transcriptions from the hit records. We offer customized programs to suit your special event. Whether a holiday ball, corporate dinner dance, fund raiser, concert, show or wedding, we adjust our musical selections to your needs. Because of this versatility, The Fantasy Big Band appeals to audiences of all ages. We hope to make that direct connection with you—to take you back easily and lovingly to some of the musical joys and romance that filled the airwaves and record grooves—to those ballrooms, nightclubs, and theaters where the great bands played.